Leprechauns and shamrocks together is so, you know, St Patrick’s Day. Yes, ma’am, it is! Kid cut out the squares at the bottom of the page. They glue either a shamrock or a leprechaun in a square. 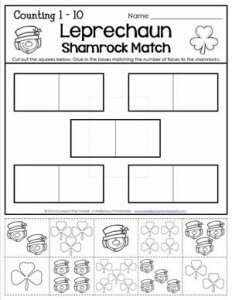 Then they find the shamrock or leprechaun that has the same number of items on it and the glue it right next to it. No specific order for gluing is required. Just match and glue side by side.